Last year, I attended a free stock investing seminar. This is part of the Philippine Stock Exchange's (PSE) campaign to promote stock investing in the country. One of the many things that I learned (and I think one of the best among them) is all about the basic rule of investment. 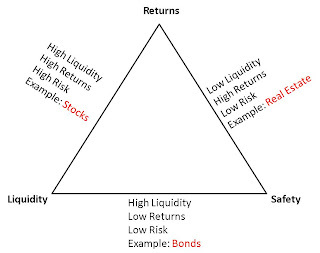 It was illustrated in a diagram called the Investment Triangle. 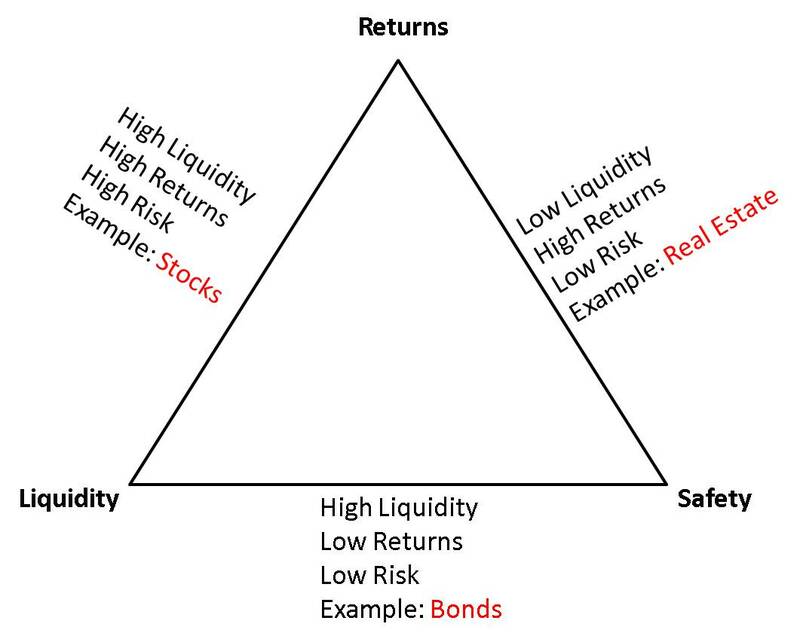 The Investment Triangle goes like this (see picture below). The opposite of vertex means the opposite of the characteristic. For example, the opposite of Safety is Risky. The investment triangle goes to show the following rules. 1. There's no such thing as a perfect investment. Investment is all about trade-offs of the three characteristics mentioned above. You just have to choose which one fits your situation better. 2. To have a high yielding and liquid investment, you have to face high risk. A good example of investments like this are building your own business, investing in stocks, and other speculative investments. 3. To have a safe and profitable investment, you have to sacrifice liquidity. A good example of investments like this is real estate. Land properties are generally appreciating but are hard to sell. 4. To have a liquid and high yielding investment, you have to sacrifice the yield A good example of investments like this are bonds or certificate of indebtedness by government and businesses. "No pain, no gain". Heard of that saying? Well it's somewhat true with regards to investing. Before you choose a particular investment and decide how much to invest on it, you need to analyze your situation. - Do I need the investment to be readily convertible to cash? - How much risk can I tolerate? These are just some of the examining questions you could ask yourself. With regards to investing, I read a good rule when it comes to risk tolerance: The younger you are, the more risk you can tolerate. The reason is that in case of failure you still have more time and opportunities to recover. That is why, it is highly recommended to start investing while you are still young. Of course each person has his/her own unique circumstances. That is why investing is a personal decision.